Confession time: I had never read or watched any adaptations of Agatha Christie’s And Then There Were None (1939) by Agatha Christie. Except for the Family Guy double episode, Psych‘s and the many other references in popular culture and media that I have watched. But, the original? Nope, never. 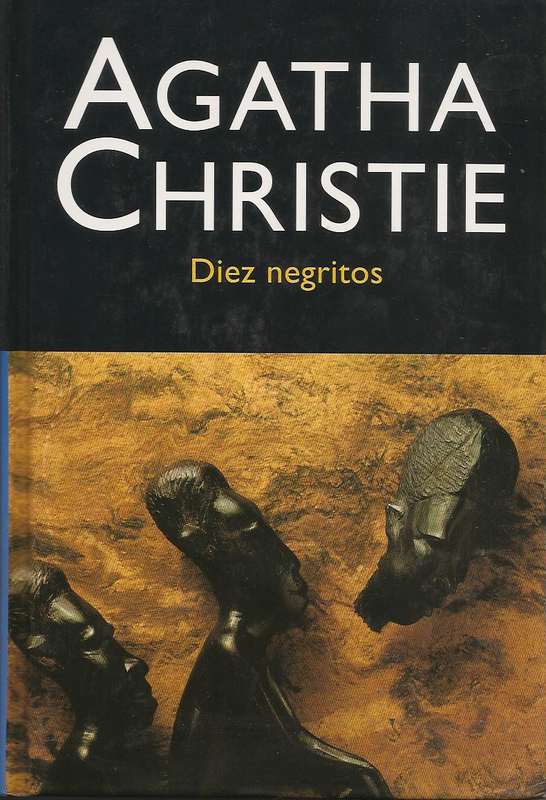 It does not help that we have kept a literal translation of the original title Ten LIttle Niggers in Spanish – click here to see it – and when I looked for an English second-hand review copy on Abebooks, I could find none. But, after some failed attempts, and some research, I found the original title, and after last Christmas’ super successful BBC adaptation I knew I had to give it a try. Because the book is such a masterpiece and a cultural landmark, I will divide my review in different sections so that I can deal with everything that I have noted down. Also, please keep in mind I am not an expert in Golden Age crime fiction, and my analysis is not an academic one. I was really pleased with the presentation of characters. When we have 10 main characters, it can be quite difficult to get a glimpse into who they are, but Christie devoted a paragraph to each of the main characters at the very beginning of the book. Having said this, I had to make a list with their names and a defining quality – profession, age, gender, etc– and,again, Christie made it very easy to put a label on each of them. But, this does not mean that the characters were plain, in fact, as the story progressed, I could see they were more multi-faceted than expected. Out of the ten characters, ten were women, and although I was not impressed by them, I was not offended either. If we take into account the lack of racial sensibility of the original title, one could expect a very misogynist book, which was not the case. Having said that, I was obviously very interested in Vera Clayhorn’s story because she was a young, single governess and her story reminded me of The Turn of the Screw so much, I wonder now if Christie was inspired by James’ novel. One of the things that disturbs me the most about Golden Age crime fiction is that I do not like the detectives at all. I find Poirot petulant and snobbish, and the few Miss Marple mysteries I have read have not left enough of an impression on me, meaning that I was probably not impressed by her. Luckily for me, there is no detective in And Then There Were None: the story is told by a third person, omnipresent narrator who does not get involved in the story. And, as the title suggests, by the end of novel, no one remains alive. I was most impressed by the setting for two reasons: one is that I love the sea, and the sea-side, and the second is that I am not usually captivated by settings, except for Indridason’s dark and twisted tales in Iceland. But, the cold, and misty English weather gave me nightmares about the sea for three nights in a row. There is something magical about the way Christie makes the environment an accomplice in the crime. I was also really surprised to find out that the house in the novel is described as modern, with electric lights and white (art deco, I guess) style. In popular adaptations the house is usually represented as a nineteenth-century mansion, three or four stories high and relying on candles. Do not worry, no spoilers here! I was surprised by the ending and did not see it coming at all although it was the most logical and reasonable solution to the mystery, and now that I think about it: Of course. Of course! And Then There Were None is a classic in 20th century English literature, not only in the crime fiction tradition. The many, many adaptations of the story have made of it a popular story and a landmark in contemporary popular culture. I would highly recommend it to anyone who enjoys reading, and who has seen any of the adaptations. Now I can’t wait to watch the BBC adaptation, which comes highly recommended by every reader I trust. If you are late to the party too, here is the trailer. I love how they are making it as dark and twisted as the original text, leaving besides popular believes about it being a ‘cosy’ story. it is not. The sea, and the house will haunt readers in their dreams like modern serial killers haunt their victims. If you have ever taken for granted Christie’s talent – like I did myself – And Then There Were None will surprise you, and then remind you why Christie was labelled the Queen of crime. It certainly is the book to convert you to Agatha Christie – one of her very best (and darkest). She was forced to change the ending for the stage adaptation, as they thought it would be too dark for a theatre audience to handle. And most of the adaptations have since followed the stage version, more’s the pity! It is, MarinaSofia. I’ve heard good things about the theatre adaptation as well… But I can’t imagine another ending. I went through a phase of ripping through Christie’s novels as a teenager, probably as an antidote to the stresses and strains of studying for various exams. It’s nice to be reminded of this novel here, probably one of her best. The setting is wonderful, isn’t it? Made for this kind of mystery. I think we all did, Jacqui! Nice to hear it’s one of her best, I was not impressed by her Poirot novels, so I was really happy to enjoy this one. Is it your favourite Christie? Had to jump in on this – while you two chose to read Christie, I was re-reading Jilly Cooper. The contrast made me laugh. Aren’t we a bunch of overworked and tired readers or what? Comfort reading for the win. I’m glad someone’s joined me at the trashy end of proceedings! I had no idea James had used it. Thank you for that, Vicky! You think I should give The Lighthouse a try, then? Hands down, this is my favorite Christie book. I’ve read it three times and now want to read it again. Thanks for reminding us it still holds up. Thank you for reading, Ann. Let me know if it still stands a fourth reading. I only got round to reading this last year. It was my first Christie and I loved it. Very clever. Glad to hear it, Cathy. Did you see the BBC adaptation last Christmas? I did. By that point I’d forgotten who did it, so it was a lot of fun. I wish I could forget who did it to watch it! Although it’s quite atmospheric, for what I’ve seen, so I may just enjoy the whole production. This is my favourite Christie and possibly one of my favourite books. I loved it. I loved that I couldn’t figure it out. Didn’t love the adaptation as much, and when I came to try and reread the book my heart wasn’t much in it. I need to try and reread it again, and recreate my original feeling. The first questioning of the adaptation… Good! I think it is such a good story, it is probably everyone’s favourite Christie. Oh yeah, this story is sinister and what a surprise! She can do dark and cosy. Have a great break Elena. We’ll be here when you get back.